Andrews is a graduate of the Koch Associate Program, a scheme funded by the same oil billionaire Koch brothers who have been pumping millions into America’s climate denial campaign under the umbrella of a “grassroots” Tea Party movement. Andrews also worked for Americans for Tax Reform, which has also sponsored Heartland’s conferences. 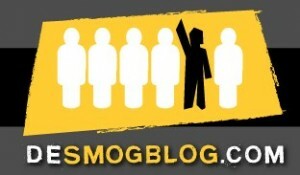 It’s a “grassroots” movement being created in the narrow interests of the likes of the Koch brothers. Since 2008, Timothy Andrews has resided in Washington DC learning effective advocacy and grassroots mobilisation techniques from internationally recognised campaigning leaders. He was employed for two years under the tutelage of Grover Norquist at Americans for Tax Reform, universally recognised as the U.S.’s most influential tax-reduction advocacy group. Timothy Andrews was also a participant in the Koch Associate Program, an intense year-long training program by the Charles Koch Institute to train a select group of activists to become more efficient agents for change. I asked Andrews about his sponsorship of the Heartland conference and it turns out it doesn’t take much to get your organisation’s name on the list of conference “co-sponsors”. Andrews said the campaign was “ill-advised” and that it would have no impact on the “high calibre of public policy output” which he claimed he’d witnessed as a previous attendee at Heartland conferences. Australian climate science deniers, think-tanks and organisations have been enthusiastic supporters of Heartland’s climate conferences since the very first one took place in New York in March 2008. One of the keynote speakers back then was Professor Bob Carter, an unpaid adjunct research fellow at James Cook University in Queensland and the science advisor to the Melbourne-based free market think-tank the Institute of Public Affairs, which was one of the events’ sponsors. Professor Carter has spoken at all seven of Heartland’s climate conferences and was listed in a Heartland document as being an intended recipient of $1667 a month from the think-tank. The IPA has been promoting climate denialist views for more than two decades and has sponsored four of Heartland’s seven conferences. The Australian Libertarian Society, where Tim Andrews is also a board member, has sponsored five Heartland conferences, included the current event in Chicago. The founder of the ALS is John Humphreys, who is now also on the advisory board of the ATA alongside the US-based Cato Institute’s Pat “40 per cent of my funding comes from the fossil-fuel industry” Michaels. As well as accepting cash from the fossil fuel industry, Michaels also accepted the role of science advisor to Tim Andrews’ website stopgillardscarbontax.com which helped to organise a plague of anti-carbon tax, anti-climate science rallies in the run-up to Australia legislating a price on carbon. Liberal Senator Cory Bernardi, who was a speaker at Heartland’s 2010 conference, helped to establish the stopgillardscarbontax website through his Conservative Leadership Foundation. Former Family First Senator Stephen Fielding is another to have visited Heartland’s conferences before coming back to Australia with climate science denial ringing in his ears. Five-time sponsor of Heartland’s climate events, including the current conference, is the Brisbane-based Carbon Sense Coalition founded by Viv Forbes, a coal mining veteran and current director of Stanmore Coal. Not surprising then that CSC should have a page on its website explaining how the emissions from coal combustion are “essential nutrients for all life” as if without them, we’d all perish. Absent from the list of supporters this year (perhaps they forgot to send the email), is the Mannkal Economic Education Foundation, founded by West Australian mining magnate Ron Manners. Mannkal, which has sponsored three Heartland conferences, hit the news earlier this year when footage emerged of climate science mangler Lord Christopher Monckton briefing the board room of this pro-mining think-tank. During the briefing, in July 2011, Lord Monckton pitched the idea of creating an Australian version of Fox News to support climate sceptic and free market ideals. The “super rich”, Monckton said, should be encouraged to start buying into the media. Few doubted that the “super rich” individual everyone was thinking of was the iron ore and coal mining magnate Gina Rinehart, Australia’s richest person who has twice supported Monckton’s tours of Australia. Another first-time “sponsor” this year is the Institute for Private Enterprise, founded and run by Des Moore who spent more than a decade as a research fellow at the IPA and provided a venue for Lord Monckton’s tour of Australia in 2010 and again in 2011. Judging by the IPE website, Moore’s principal activity recently has been writing letters to Australian newspapers. 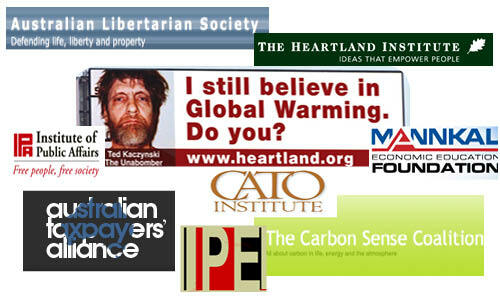 Australian political party The Climate Sceptics has also supported three Heartland climate conferences. To complete our list of Aussie backers of Heartland’s climate change confusion events, there’s the Lavoisier Group, which was established by former Western Mining Corporation boss Hugh Morgan to fight any support for Australia signing the United Nation’s Kyoto deal. Morgan is a former director of the IPA where his son, William, is now on the board. So Tim Andrews and others join the list of Heartland supporters happy to continue their association with a group that claims most climate experts are mass murderers. Other previous backers have been less charitable since the billboard debacle, with a cavalcade of current and former corporate funders publicly announcing they won’t be supporting Heartland in the future. As outlined in The Guardian, even seven staff members have left in disgust. In fact, one of the few people on the planet who thought the billboard was a good idea, was Australian devotee Professor Carter who found it impossible to criticise those who pay him. We are starting to hear from genuine conservatives who are concerned about the extremist tendencies of the contemporary right. One of them, Michael Fumento, was finally provoked into action by Heartland’s billboard. I asked him for the details of his calculation, but he didn’t respond. Do you know who this guy is? Ignore Julian Fitzgibbon (if that’s even his real name). He uses alias littlegreyrabbit. Has a Holocaust denying blog on wordpress.com with that alias. Elsewhere he claims to be working for ASIO, but as far as I can tell, he’s a Holocaust denier masquerading as a skeptic on the internet. He is a real piece of work. Apparently an old geezer with too much time on his hands.